Hi there. Have you missed me? Sorry about the uncharacteristic lack of posts over the past week, but I was trying a new experiment: If I don’t have anything of value to post, don’t post anything. The past week or so has been insane for me — Cat and I decided to make our wedding invitations ourselves, which was good in that it gave us fine control over materials, design, and quality. They turned out to be kind of amazing, and for about half the price of professionally made ones. The downside is that this turned out to be an incredibly arduous process that had us pulling several all-nighters in a row. We are not young people anymore. It’s been a hardship for us old folks. That, on top of a several-day work conference, a trip to Orange County for a family wedding, and tomorrow’s flight to New York City for Sony’s I-hope-to-god-it’s-worth-the-trouble press event. On top of 60 hours of day-job work per week. Alas, Telebunny has suffered as a result. That being said, I did put the wraps on The Anatomy of Castlevania print volume. Hoorah! I even took the time to create a mini version of the book for the budget-minded, since the large format I used clocked in at a pretty pricey total for the paperback edition — Blurb doesn’t offer the 10×8″ landscape format in black and white. The smaller book doesn’t include most of the supplemental content I added for the larger formats, but the Anatomy of a Game text exists in its entirety (and it’s been editing for the shocking number of typos I committed in the web version). You can check out the first 15 pages of each edition on the book pages to see how I went about the layouts and stuff. I had a lot of fun putting this issue together, so you can expect more along these lines. 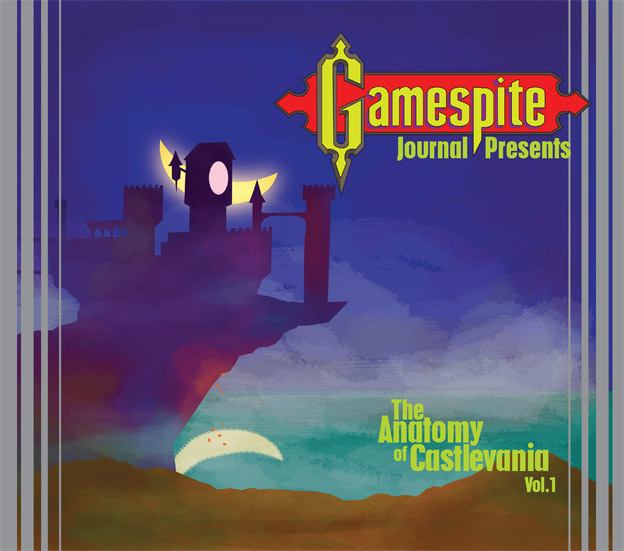 This entry was posted in Games, GameSpite and tagged anatomy of a game, castlevania, gsj13, nes. Bookmark the permalink. Thank you for putting together the budget version. My wallet is smiling. Can’t wait to read it. Also, the code PRESIDENTSDAY will net you 25% off all orders with no minimum. Don’t know when it expires, but it may be today (Monday) only. Looking good. That is a phenomenal amount of layout work there. Aaaand its ordered. Two of them, to be precise. That PRESIDENTSDAY discount is no joke – it basically pays for the shipping and then some. I have a stack of books on my nightstand threatening to crush it into oblivion but as soon as this arrives, this is getting added right to the top of that precarious stack. Already read the texts on the website. This is one of your finest pieces of work, Jeremy! This looks great, Jeremy. I’m glad that you turned these posts into a book. Would love to see you continue the long-form writing on a single game. I’ve just finished writing a similar book on Wario Land 4. The format is great for getting into the nitty gritty details of the design. Don’t leave us hanging, man. Where can we buy your book? Well, after some debate, I finally went ahead and ordered. Got the hardcover. Can’t wait to get it in. PRESIDENTSDAY code still works as of now, at any rate. I’m pretty sure this is the most expensive book I ever ordered, for recreational purposes at least. Love the layout and use of 8-bit sprites. At first I was sad we’d have to wait longer for the second Sega volume of GSJ, but looking at the Blurb preview it seems to have been the right choice. Yeah. I wish self-publishing like this didn’t cost so much to produce, but when your book has a potential audience that numbers in the dozens rather than the hundreds of thousands, you roll with it. Hopefully everyone will enjoy the results. I feel like the fact that you can preview the layout and read 80% of the content online already means there’ll be no nasty surprises, at least.